Previously on Sherlock: The Sign of Three. The answer to that — the usual. John Watson. I recall calling The Reichenbach Fall brilliant television and a veritable rollercoaster of emotions. Then what am I to call this? Because this is even bloody better. The facts of the case are these: Sherlock Holmes is a murderer. Sergeant Sally Donovan was right. We’re standing around a body, and Sherlock Holmes is the one that put it there. Except he didn’t do it because he got bored. Didn’t do it because he’s insane. To protect John and Mary Watson, Mr and Mrs Psychopath, Sherlock Holmes murders Charles Augustus Magnussen in cold blood, in front of his brother, to prevent him from destroying their lives and that of their unborn child. He then expects to go on a mission for MI6, to Eastern Europe, a mission that Mycroft estimates will kill him within six months. Sherlock Holmes just gave the rest of his life — spent in prison, spent being tortured, what difference does it make — to the people he vowed to protect, whatever may come. For love. What Mycroft Holmes sees is a frightened little boy, his brother who used to want to become a pirate. What John Watson sees is his best friend and one of the loves of his life, making a huge bloody sacrifice. What Sherlock Holmes sees is something he can make peace with. Yes, Magnussen’s murder is shocking. Doubly so because the resolution is so final, and so seemingly inescapable. Sherlock made a mistake: he underestimated Magnussen. Magnussen, the Napoleon of Blackmail, is Sherlock’s mirror image even more so than Moriarty was: it’s the same concept, just a different interface. The typeset is different and there’s a different filing system, but the words on the screen is something we know very well, and Sherlock wasn’t ready for that. But then, Sherlock found a permanent solution to a temporary problem not by using his wits or his mind palace — but by using his heart, and only his heart. The Fall may have been a hybrid, a very cleverly concocted plan involving Mycroft and two dozen other people, though driven and tinted by his feelings for John and his friends. But this, this was pure instinct. Sherlock got it wrong, and he was willing to pay the price. Just not before making sure that his loved ones were safe. It’s John Watson that gets Sherlock’s heart beating again after he’s clinically dead in surgery. It’s John Watson who Magnussen targets because that’s the only way. Sherlock and John is what it comes down to, a lot of the time — like when Sherlock pushes John to accept who Mary is, in that moment, at Baker Street. John dreams of the war, and then he dreams of Sherlock, because this is what he misses. 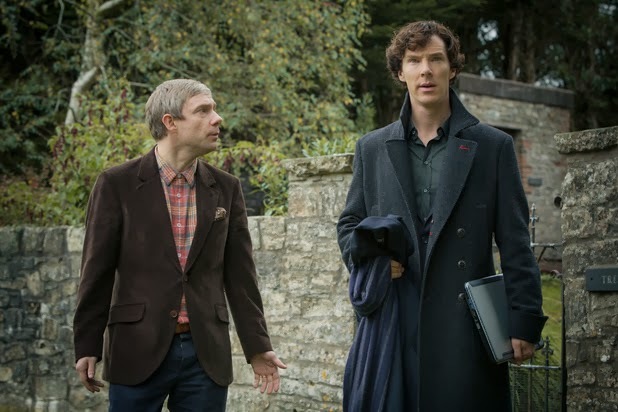 The thrill of the chase, working cases with Sherlock. That’s why he busts down the doors of a crack den. The danger is what he needs, and this is what he falls back on. His relationship with Sherlock is the building block of this triad, this beautiful thing that the three of them have. That’s where he can think. This episode is not only a study in Sherlock having a heart and making mistakes because of it and not regretting it for one single second — it’s also a study in John Watson, and the company he keeps. Mr and Mrs Psychopath are, to use the popular vernacular, badasses. The question isn’t why Mary is the way she is, because we have the answer right there. She loves John Watson, and John Watson fell in love with the danger that he sensed in her. Sherlock said dangerous, and there he was — and it’s the same with Mary. He knows, because that’s what he meant when he admonished Sherlock about the coat collar turned up, and the cheekbones. This episode adds so much more to the codification of the threeway that’s happening between John, Sherlock, and Mary, it’s wonderful. Remind you of anything? “Oh, God, yes.” That’s what John said when Sherlock first asked him if he wanted to come along. Also: note how I didn’t say ‘forgiving Mary.’ Because that’s not what’s happening: John makes it very clear that there is nothing to forgive. He’s pissed at her for not asking for help outright, yeah, the same anger that Sherlock held, but her life, her decisions, her work — that’s hers to know and to share, and if she chose to keep that a secret, then that’s fine. When has a show allowed a female character that kind of life without a big ol’ redemption arc? There’s no redemption. Just the facts. And the fact is that these three people love each other. This episode basically has three cliffhangers packed into one. First, we think it’s all over. Then, we second-guess and think, oh, there must be a plan! Then we realise that there really isn’t one, though. That’s when Sherlock and John say goodbye, seemingly forever, and that’s when I start crying like an idiot, because this can’t be. John only just got him back, it’s not fair! And then, the terror at watching John lose Sherlock all over again, is taken over by dread and excitement and sheer bloody relief. Jim Moriarty, you have no idea how glad I am to see your face. Sherlock removed John’s chair because it reminded him of how much he missed his best friend. I guess it’s safe to say it’ll stay there now — and there’s going to be a third armchair settling in. Along with a cot, probably. Let us appreciate the fact that Molly Hooper gets to slap Sherlock three times because of how reckless he’s being. Let us appreciate that it’s her, along with Anderson and Mycroft, who guide him through the experience of getting shot in his head. Let us appreciate that it is Moriarty, time and time again, who shows us directly where Sherlock Holmes’s heart truly lies. Let us further appreciate the clever play on the canon story of Sherlock’s return, The Empty House, by employing a dummy dressed as Sherlock in an otherwise empty house that’s used to draw an assassin out of hiding. I cant accept the fact, that Sherlock is a murderer. Even though he did it out of love, that point you elaborated in your review quite well, i still cant find solace in that. Would it have been different if Magnussen had held a gun to John’s head, instead of flicking his eye? Because, strictly speaking, John is a murderer, too, has committed murder for Sherlock in the first episode. He killed the cabbie to save John’s life — and the gun wasn’t real, Sherlock would have practically killed himself, had he chosen the wrong pill. It wasn’t even really self-defence, and John could have just fired a warning shot to distract the cabbie. In this case, Magnussen was threatening to destroy an entire family. He wasn’t holding a gun, but it was absolutely clear what would happen. Sherlock knew Mycroft wouldn’t have taken Magnussen into custody, no matter what he knew. Sherlock killed someone in what comes down to self-defence, although in the eyes of the law, he’s a murderer. Killing Magnussen shouldn’t have been the only solution, no. But it was, and I prefer knowing that Sherlock is capable of killing over Magnussen haunting the Watsons’ lives. I still have a question, even after watching all of season three – what was the ‘big clue’ or the one thing Sherlock did that was so uncharacteristic in The Reichenbach Fall? I feel like I’m still missing it! Would that I knew… I’m still not sure if there really was a big fat clue to be had, or if Moffat was lying, actually. In any case, nothing really stood out for me in that respect in the explanation theories or in what he says. Perhaps it’s the crying, perhaps it’s the phone call instead of texting, I don’t know. Throwing his phone away instead of taking it? Or was it not his phone he used, was it Moriarty’s instead? No idea. Urinating in the fireplace of 221B Baker Street, granted poor Mrs Hudson and John have seen some strange things in this flat, but this has to be the most disgusting act ever performed there. Augustus Magnussen has to be the most vile villain to cross the path of John and Sherlock. His memory palace, used for ultimate evil, alarmed even the great detective in the end, leaving Sherlock no alternative. When Jeremy Brett’s Holmes was confronted with the line “I’ll see you hang for this!” from one criminal he had apprehended, his calm response was classic, “Surely, that pleasure must be mine.” In this case, although not a pleasure for Holmes, it certainly offered the ultimate finality required after all the evil Magnussen had accomplished in the episode. As for the ending, is he or isn’t he, that is the question, and if so, how? Oh what a tangled web Mark and Steven have weaved. Next“You Like Me.” — Almost Human: You Are Here.